Different Worlds is almost here! In just one month, it shall be unleashed upon you all.1)Have you preordered your copy yet? There’s still time! Don’t forget that paperbacks ordered through my online store come with art postcards, a coupon for a free copy of the ebook and more! To celebrate, today I want to tell you a little bit more about my characters. Here are some fun facts about my two narrators, Henry and Tamara. Some of this is mentioned or alluded to in either Fourth World or Different Worlds, and some of it is brand new! Henry’s dad is Sikh and is from Punjab. His mom is American (but spent much of her life in Delhi, moving there with her family after her father died) and grew up with a mixed religious background, with a Christian father and a Hindu mother. Henry is an atheist and he is from Mars, and he would like you to not forget that. Henry may not be as much of a polyglot as Isaak, but he is fluent in English and proficient in Hindi, Punjabi, and Expletives. He’s also fluent in half a dozen programming languages, several of which have not been invented in 2016. Henry’s legal name isn’t actually Henry. But we’re not supposed to talk about that. I haven’t found the perfect dream cast for Henry yet. I saw a fan cast on Tumblr of Yoshi Sudarso, whose hair is awesome and very Henry. Unfortunately, he’s Indonesian, not Indian. Do you have a dream cast for Henry? Let me know in the comments! Tamara’s moms are both her biological parents. Breakthroughs in stem cell research made it possible starting in the 2040s, though the procedure was still very expensive in 2056 when Tamara was born. Fortunately for Tamara, her moms aren’t exactly short on funds. Tamara was born in Cydonia province, but moved to Tierra Nueva in Aeolis province when she was eight, when GalaX’s new tech firm, AresTec, opened. She quickly became friends with Isaak when Bryn (Tamara’s mom) and Jesica (Isaak’s mom) met at a GSAF fundraiser. Isaak’s family had moved from Elysium province the year before, so he was eager to befriend another transplant. They became friends with Henry in middle school—Henry went to the same school as Isaak before they got accepted to the Academy—and soon were an inseparable trio. My dream cast for Tamara would be Klariza Clayton. I hope you enjoyed these factoids about Henry and Tamara! 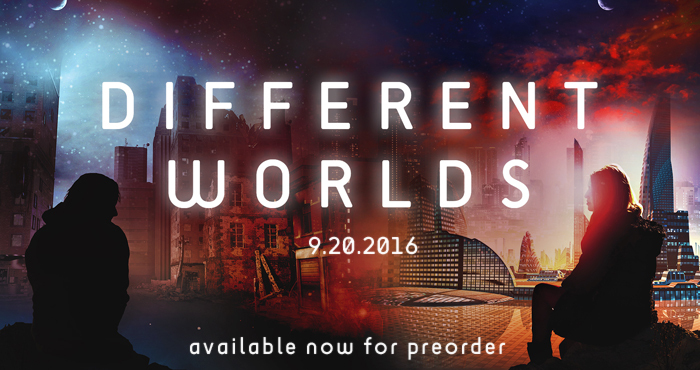 I’m looking forward to sharing more about them when Different Worlds releases on September 20! 1. ↑ Have you preordered your copy yet? There’s still time! Don’t forget that paperbacks ordered through my online store come with art postcards, a coupon for a free copy of the ebook and more!